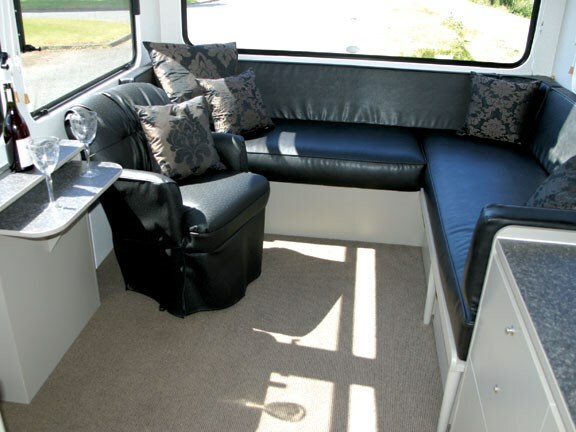 With growing numbers of people electing to live semi-permanently in a motorhome, being able to inject a little individuality into one is a significant buyer consideration. Pukekohe’s Trail-lite offers that flexibility as part of the deal. Manufacturing around 70 units a year, Trail-lite is one of New Zealand’s largest motorhome manufacturers. The family-owned company specialises in custom-designed vehicles ranging from 5m to 11m in length. Originally a builder of caravans (the first rolled from the factory in 1954), the last 22 years has seen the company’s focus shift to motorhomes. With the half-century track record, you’d expect the factory to be a regimented production line environment. But you’d be wrong. In fact, what’s most surprising about Trail-lite is the scale of ‘customisation’ it offers buyers. There’s a choice of chassis manufacturer, interior layout, interior surfaces, decor and a wide array of electronics and accessories. In short, there’s every opportunity to have a new motorhome built pretty much to your precise requirements and aesthetic preferences. "It means," says Trail-lite business development manager Shaun Newman, "that it’s likely to be not just the only one of its kind in the campground but in the whole of New Zealand. We never build exactly the same motorhome twice." 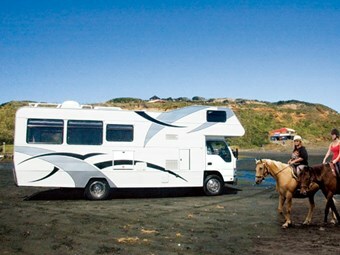 The 8m motorhome is one of the company’s most popular sizes. This one (with aluminium external sheathing) is built on Isuzu’s NQR 500 chassis and powered by a turbocharged 5.2-litre diesel with a six-speed manual transmission. Isuzu’s chassis is rated to nine tonnes: the motorhome package only weighs five (and around six fully loaded with fuel and water), so the engine’s never going to be stressed. But it does mean you’ll need a Class 2 driver’s licence. While it will sleep two couples in comfort and relative privacy, it’s really designed as an expansive, luxury home for a couple, and its full air-conditioning and heating (gas) allows intrepid explorers to venture into all climates. Trail-lite built the vehicle specifically for the Hamilton Motorhome Show later this month to showcase its workmanship and the range of options available – and it’s an arresting package. There’s an easy "flow" through the motorhome, and the spaciousness is enhanced by the natural light pouring in through large windows and roof-hatches. There are expansive work surfaces, crisp finishes, plenty of lockers, a generous bathroom and enough electronic toys to keep a technofile entertained for weeks. Top feature for me, however, is the "north-south" queen-size double bed over the cab. 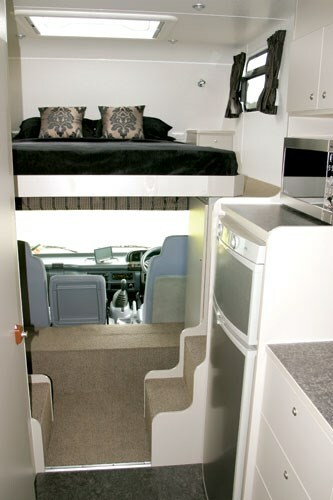 Where most motorhomes have east-west beds over the cab, this model’s orientation gives an attractive symmetry to the forward area. Access to the island bed is via matching staircases on either side, and there are even two side tables. Good headroom allows you to sit up in bed, and the large, strategically placed hatch in the roof invites you to admire the stars. Very romantic. The bed also tilts up (and is held there by gas struts), offering easier access to the cab. Moving down the motorhome from the cab you’ll find a large galley on the left. 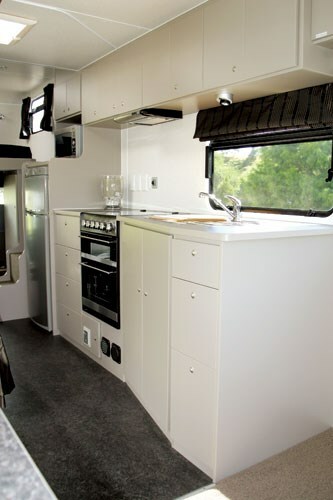 It’s nicely-configured, with excellent working space, a microwave, a large (three-way) fridge-freezer, a four-burner gas cooker/oven and a stainless steel sink with hot/cold mixer all within easy reach. The array of lockers contains a stylish selection of crockery, cutlery and glassware – all supplied by Nest. Immediately opposite is the bathroom. It contains a cassette toilet, separate shower, vanity with hand basin and heated towel rail. Fastidious guests will like the separate shower – a dry toilet is always a treat. The motorhome carries 400 litres of fresh water. The grey water tank is 220 litres. The emphasis on understated style continues in the lounge/dining area. It’s dominated by two plush swivel armchairs, with a matching L-shaped settee. And when you do invite a couple over for a few nights, that settee contains a pull-out double bed. 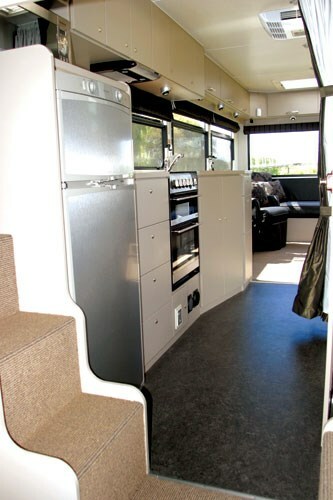 If the selection of storage space inside the motorhome is insufficient for your needs (you really must learn to travel more lightly), there are additional lockers and drawers outside – built into the motorhome’s bodywork. A large one at the back contains a Port-a-Bote – a fold-up row boat. Advances in electronics have opened a new dimension in motorhome accessories, and Trail-lite has taken full advantage of the trend. This model’s equipped with a compact roof-mounted satellite dish (from Majestic – it’s fully automatic, and finds a signal without any coaxing), two large LCD TV screens (one inside, one outside) and a high quality Sony home theatre system. The Sony delivers its liquid tones through five miniature cube speakers mounted around the motorhome. Remarkable surround sound from such tiny, unobtrusive objects. screen lives in a shallow locker built into the bodywork. It folds out as a support for the screen. 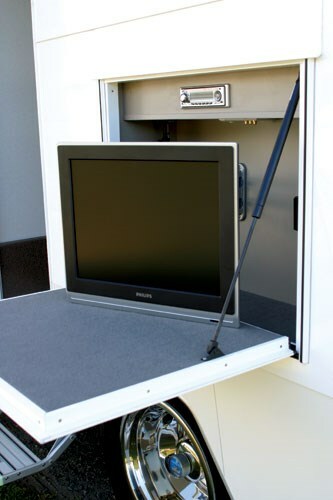 The inside wide-screen TV (26") lives in the motorhome’s "entertainment" console. All those electronics can sap a battery fairly quickly. To cater for that, the Trail-lite comes with four house batteries (providing a total of 520 amp-hours) which receive supplementary charging from two 100-watt solar panels mounted on the roof. To run 240-volt AC appliances, the motorhome’s also equipped with a 1500-watt pure-sine inverter. The Isuzu provides seating for three up front (and two more in the back). It’s a comfortable cab, with superb visibility. 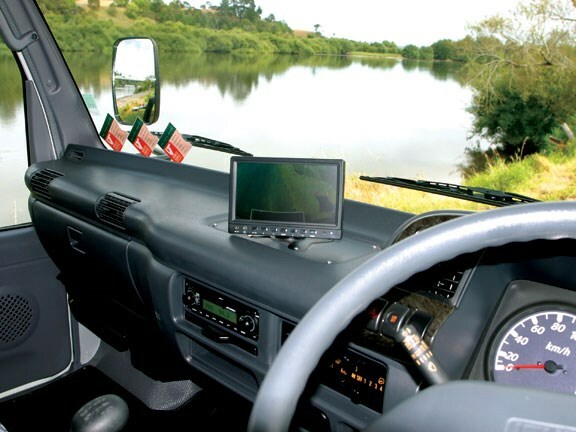 If you find manoeuvring an 8m motorhome a little intimidating, the reversing camera mounted at the rear (displayed on a dash-mounted screen) will help. Trail-lite has also incorporated a useful map-shelf in the roof. Even if you have GPS, real, old-fashioned paper maps are great for route-planning. allows you to become the "architect of your dreams". 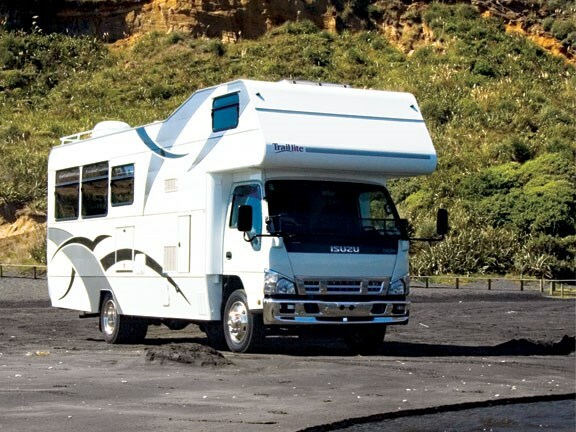 The motorhome’s delivered with Isuzu’s standard three-year warranty (or 100,000km) on the chassis, and a five-year structural warranty on the motorhome body. It will set you back around $215,000 (inc GST).